The Project H, the ensemble responsible for my favorite jazz-oriented performance by Kansas City musicians of the first few months of 2015, returns to the Westport Coffee House on Thursday, May 7. *Steve Paul considers Congressman Emanuel Cleaver’s latest proposals for the Jazz District. *The Columbia Daily Tribune published a feature about the quartet of Bobby Watson, Keith Brown, Ray Drummond and Marvin “Smitty” Smith. *The Pitch endorses the new album by OJT. *KC Jazz Lark considers the relationship between his blog and his new role at a jazz publication. *Chris Burnett promotes ARC Label Week in a Tumblr post. *David Basse was interviewed by Joe Dimino. *Comment o’ the Week: Dean Minderman- Thanks for the link to StLJN, though it would seem that anyone who doesn't already have tickets for Robert Glasper is out of luck, as all four shows are sold to capacity and then some. With two local guys (Mark Colenburg and Keyon Harrold) on the gig, I guess that's not a big surprise, though. *From a press release: Kansas City Jazz Legend Stan Kessler is not only a gifted performer but also wears the many hats of trumpet/flugelhorn instructor, bandleader, clinician, writer/arranger and educator. He performs, and leads, in numerous ensembles including the long-running Sons of Brasil, The Stan Kessler Quartet, Stan Kessler’s TV, HoraceScope, The Uncertainty Principle, Parallax, Mistra Fina and Passport…. with Tim Whitmer & The Consort Band, Wednesday, May 6, 2015, Unity Temple on the Plaza, $7. As I browsed the day’s new releases at Amazon last Tuesday, I was pleasantly surprised to spot Limitless, the latest effort by Julian Vaughn, listed among the site’s top 100 sellers. I can’t remember the last time I saw a Kansas City based jazz musician place so prominently on Amazon’s sales chart. It’s not difficult to understand the appeal. Vaughn plays insinuating contemporary jazz. Limitless includes quiet storm R&B, upbeat tracks with hip-hop elements and a tribute to one of the bassist’s primary influences, the late musician and basketball star Wayman Tisdale. The album release concert for Limitless is Friday, May 8, at the Gem Theater. A dazzling survey of centuries of Panamanian music, Panama 500 was one of the most exciting releases of 2014. The bandleader and pianist Danilo Pérez is likely to reinterpret some of that memorable material at the Folly Theater on Saturday, April 25. *Eldar Djangirov promotes World Tour Vol. 1 album in a video. The new release that is “exclusively available” at his site. *KC Jazz Lark foresees a bright future for the Kansas City Jazz Orchestra. *Steve Lambert’s full calendar is noted by The Pitch. *Danielo Perez’s forthcoming concert is highlighted in Joe Klopus’ latest column. *Matt Kane’s album was featured on KCUR’s weekly Local Listen segment. *Joe Locke and Marc Cary chatted with Joe Dimino. *St. Louis Jazz Notes reminds readers that Robert Glasper performs at Jazz at the Bistro tonight and tomorrow. *Comment o’ the Week: Anonymous- Once you get past the tiresome and curmudgeonly reference to hard bop as an "inauspicious format," that wasn't a half bad review. Consider yourself chastised. *From Mike Metheny: Exactly 100 years after the arrival of patriarch Harrison Metheny (1887-1980) in Lee's Summit MO, the story of the Metheny family is being told in an exhibit at the new Lee's Summit History Museum. What an honor it is for us to be included! The museum's grand opening is on Wednesday, April 22 at 5 p.m. And normal museum hours will be 10 a.m. to 2 p.m. Thursdays and Fridays, 10 a.m. to 4 p.m. on Saturdays. For more information, please visit the Museum's Facebook event page or the website. *From Take Five Coffee + Bar: Thursday, April 23, 7pm: Marcus Lewis Big Band- …Ferocious swing the way only a high-caliber big band can deliver it… $5 cover. Friday, April 24, 8pm: Schlambert- Vibraphonist Peter Schlamb and saxophonist Steve Lambert join forces… With Karl McComas-Reichl on bass and John Kizilarmut on drums… $5 cover. Saturday, April 25- … closed this night for a private event. (A wedding!) Sunday, April 26, 10am - 2pm: Sunday Jazz Brunch: Paul Roberts and Peter Schlamb… and bassist Forest Stewart for a tribute to the great Chick Corea/Gary Burton group… No cover. Creating a compelling straight-ahead album in the style of the Jazz Messengers is difficult in 2015. Yet Acknowledgement, the new release by Matt Kane and the Kansas City Generations Sextet, manages to infuse the inauspicious format with fresh energy. The New York-based drummer has devised an essential document of Kansas City’s jazz scene. Kane, saxophonists Steve Lambert and Michael Shults, trumpeter Hermon Mehari, pianist Andrew Ouellette and bassist Ben Leifer apply their formidable talents to the compositions of Ahmad Alaadeen, Pat Metheny and Bobby Watson. The pairing of excellent musicians with the melodies that have come to define the Kansas City sound is consistently persuasive. Kane deserves credit for allowing Shults and Lambert to shine. Their contributions consistently elevate Acknowledgement. The pair tear it up on Alaadeen’s “ASR." The programming of Alaadeen’s “And the Beauty of It All” and Watson’s “Wheel Within a Wheel”- the familiar selections are album’s fifth and sixth tracks- is capable of acting as an emotional one-two punch on Kansas City's jazz advocates. For anyone who has logged significant time at clubs including the Blue Room and the Green Lady Lounge in recent years, Acknowledgement sounds like home. While Saturday’s concert at the Gem Theater is billed as an appearance by the Joe Locke Quartet, the vocalist Kenny Washington will almost certainly be the star of the show. Pianist Ryan Cohan, bassist Lorin Cohen and drummer Jaimeo Brown round out the vibraphonist's band. *New albums by Matt Kane, OJT and Dominique Sanders are reviewed by KC Jazz Lark. *Joe Klopus highlighted Joe Locke’s forthcoming concert in his column for The Kansas City Star. *The Pitch recommends the Kansas City Jazz Orchestra’s tribute to Stan Kenton. *The trio of Avishai Cohen, Justin Brown and Eric Revis will perform at Take Five Coffee + Bar on May 14. *A blogger reviewed the Kansas City debut of Max Raabe und Palast Orchester at Helzberg Hall. *Anat Cohen is among Joe Dimino’s recent interview subjects. *From Take Five Coffee + Bar: Thursday, April 14, 7pm: Rob Scheps/Jason Jackson Sextet: The Music of Wayne Shorter- Saxophonist Rob Scheps is a roving powerhouse… he’s got Jason Jackson with him, trombonist with the Vanguard Jazz Orchestra… (with) hand-selected Kansas City players (Brad Gregory on alto saxophone, Roger Wilder on piano, Bob Bowman on bass, Brian Steever on drums). $5 cover. Friday, April 15, 8pm: Brandon Draper Flux Trio- Brandon Draper is a superlative percussionist… he’ll be launching into an evening of “mind altering soundscapes, groove and improvisation” in the company of Matt Otto on saxophones and EWI and Luke Polipnick on guitar and bass… $5 cover. Saturday, April 16, 8pm: Steve Houghton Trio- Drummer Steve Houghton (is) Professor of Percussion and Jazz at Indiana University. (with) Bob Bowman on bass and Danny Embrey on guitar. $5 cover. Sunday, April 17, 10am - 2pm: Sunday Jazz Brunch: Paul Roberts – Origins of Groove… No cover. If the musicians in attendance at Take Five Coffee + Bar on Sunday felt the same way I did, the Kansas City jazz scene may never be the same. Kansas City’s elite masters of improvised music represented about a third of the audience of about 50 that witnessed an ingenious performance by Trio M. The efforts of bassist Mark Dresser, pianist Myra Melford and drummer Matt Wilson might inspire them to create even more expansive sounds. Trio M demonstrated that experimental jazz can be every bit as fun as mainstream swing. Dresser windmilled. Medford came down with a case of crazy feet. Wilson seemed to use everything but the ceiling to create percussive effects. By ignoring conventional boundaries, Trio M reframed the case for acoustic jazz in 2015. I look forward to the ripple effect. Admirers of adventurous jazz shouldn’t let Trio M’s pedestrian moniker deceive them. The ensemble features three extremely accomplished musicians. As the embedded video indicates, pianist Myra Melford has a unique conception. Bassist Mark Dresser has recorded with Anthony Braxton, Joe Lovano and John Zorn. Drummer Matt Wilson is one of the most engaging figures in modern jazz. Trio M performs at Take Five Coffee + Bar on Sunday, April 12. *Former Hannibal residents Matt Kane, Michael Shults and Andrew Ouellette are featured in their hometown newspaper. *The Pitch recommends a gig by Dominique Sanders’ trio. *Karrin Allyson is among Joe Dimino’s recent interview subjects. *Tweet o’ the Week: Green Lady Lounge- Easter at Green Lady Lounge: 627 Big Band 8:30-11:30 celebrating a year of Sunday gigs at Green Lady. Never a cover. *Comment o’ the Week: Saxman- The only thing less relevant than jazz to most people is the "performance art piece". *From Shades of Jade: ...Shades of Jade has gotten off to a great start partnering up with local bands in the Kansas City area... Now they have extended their reach to an up and coming band from Minneapolis, MI called Nooky Jones! … these two bands have similar influences in neo soul… Shades of Jade will continue to exclusively debut their new original music every third Friday of the month this year from 9pm-1am. The Tank Room… 9pm-1am. *From a press release: The American Jazz Museum will join thousands of musicians and hundreds of concert presenters across the country this May in celebrating National Chamber Music Month. The American Jazz Museum’s presentation of a monthlong calendar in the Blue Room jazz club that features Charlotte Embry and Soigné on Friday, May 1st; the Dino Massa / Chris Burnett Group on Friday, May 8th; and, the Jazz Disciples with vocalist, Lisa Henry and poet, Glenn North, is part of a nationwide initiative to raise public awareness of the many styles of small ensemble music performed and presented today… Chamber Music America defines chamber music as works for small ensembles of 2–10 members, playing one to a part and generally performing without a conductor. Jazz is under assault at The Kemper Museum of Contemporary Art. 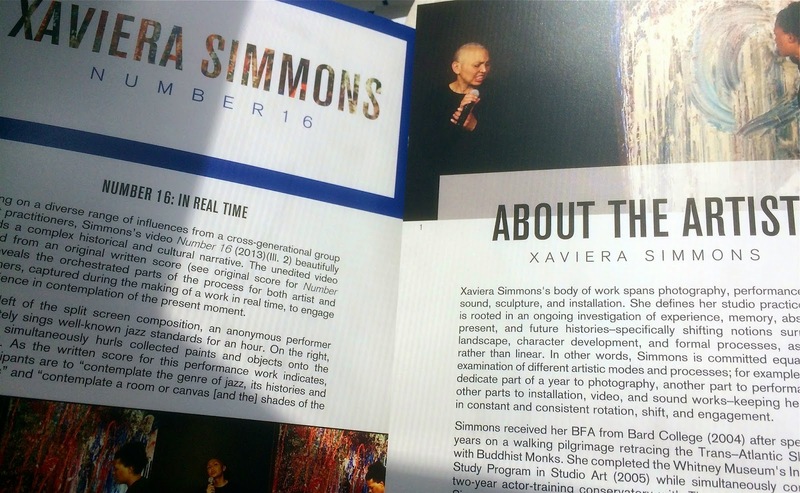 Interpreting Xaviera Simmons’ “Number 16” exhibition as anything but an indictment of the music is difficult. The video installation depicts a woman belting out a capella versions of jazz standards on the left side of the screen as the artist violently flings a variety of materials at a canvas on the right side of the looped video. Notes in an accompanying program indicate that the vocalist and the visual artist were asked to “contemplate the genre of jazz, its histories and implications” during their simultaneous contributions. Certain lyrical phrases and vocal nuances in the vocalist’s guileless delivery of songs like “My Funny Valentine” seem to trigger especially antagonistic responses from Simmons. Transfixed by “Number 16” at the museum last week, I repeatedly guffawed at Simmons’ seemingly mean-spirited statement. Disturbed either by my vocal responses or repelled by the noisy art, no other patron stuck out the jarring work of art for longer than 30 seconds. The provocative installation runs through June 7. *KC Jazz Lark documented Saturday’s Art Blakey tribute at Take Five Coffee + Bar. *Jeff Harshbarger and Hunter Long will receive $10,000 grants from the Charlotte Street Foundation. *The Kansas City Star reports that the American Jazz Museum will receive a $427,000 appropriation from the city this year, $65,000 less than it received last year but $60,000 more than the $125,000 cut initially proposed in the new city budget. *Jason Jackson was featured in Joe Klopus’ column for The Kansas City Star. The Pitch also notes the trombonist’s appearances. *The world premiere of the new opera ”Charlie Parker’s Yardbird” will take place in Philadelphia on June 5. *Pat Metheny will serve as the artist-in-residence at the Detroit Jazz Festival in September. Here’s the festival’s schedule. *The Matt Otto Quartet and the People’s Liberation Big Band will perform at the Wichita Jazz Festival later this month. *Benny Heckman is among Joe Dimino’s latest interview subjects. *Tweet o’ the Week: Dave Douglas- @sunthekevin @HappyInBag Raspberry zone! Unfortunately we were all in range of the joke. We winced. BTW He only told it once, never again. *From the Green Lady Lounge: Wed: Adam Schlozman's Earth Trio 7:30 to 8:30 - Adam begins his every weds 1 hour gig working on all original compositions for a new album - Adam Schlozman, Joel Stratton, John Kizilarmut. OJT 9 to mid - New Album release date April 22nd - Next album will concentrate on original compositions from all three members of OJT - Ken Lovern, Brian Baggett, Kevin Frazee. Thurs: Kevin Frazee Trio 9 to mid - Matt Hopper (Matt Hopper... has completed recording most of a studio album concentrating on his original compositions with Kevin and Ken), Kevin Frazee and Ken Lovern… Fri: Tim Whitmer Quart 5:30 to 8:30 - Tim Whitmer, Ray DeMarchi, Taygun Ozakinci, Todd Wilkinson. Electric Tinks 8:30 to 10 (Orion Room) - This is Peter Schlamb's Quartet or Quintet depending on night, focusing on playing music from his 2014 Tinks Album - Peter Schlamb, Hermon Mehari, Karl McComas Riechl, Ryan Lee, etc... band will vary but it's every 1st Friday 8:30 to 10pm in our Orion Room through the rest of 2015... except with Paul Shinn Trio is in town. Chris Hazelton's Boogaloo 7​ 10pm to 1:30am - Boogaloo7 is back the 1st 4 Fridays of every month through the rest of 2015 (Mark Lowrey Trio has 5th Fridays)… Boogaloo7's newest 45 record will release in May of 2015... I'm happy to say he's going to record a live at Green Lady album sometime this summer or fall... Sat: Brett Jackson Quart 6 to 9…. OJT 9:30pm to 1:30am. *The Kansas City Jazz Calendar has been updated for April.